Review Fix Senior Editor Olga Privman shares her picks for best Off-Off Broadway performances this year. “Hansel and Gretel” by Opera Manhattan, Inc: Without a doubt, every member of this cast is extraordinarily talented, and given the small space, the opera was put together impeccably. Aside from being overwhelmingly talented vocalists, the respective players also exhibited a tremendous capacity for acting, at times even bringing a touch of comedy to this traditional Christmas tale. “Candide” by the Heights Players: This troupe’s take on Bernstein’s take on Voltaire’s take (quite the mouthful, isn’t it?) on the Enlightenment’s inherent flaws hosts some of the widest array of vocal talent in the borough. The impeccable presentation of “Glitter and Be Gay” beautifully showcases the sensitive combination of comedy and tragedy. “Much Ado about Nothing” by the Oberon Theatre Ensemble: Although missing the associated costumes and elaborate scenery of this famed Shakespearean comedy, the players at Oberon still manage to put on a more than quality show. Benedick is a tad more wacky and Beatrice somewhat is somewhat less graceful, but they nevertheless managed to complement each other quite well. At the end, it’s easy to walk away with the feeling that had the Bard carried our social conventions, he would not have been terribly disappointed with this performance. The cold, steel double doors at the head of the Gallery Players Theater, housing the lively and colorful musical delight, “Thoroughly Modern Millie,” paint the perfect dichotomy for the production. The musical focuses on a young, opportunistic, henceforth flapper who intends to be the ideal incarnation of a modern woman in the Roaring ‘20s. Throughout the performance, the theme of these seemingly contradictory qualities continues as the musical tackles the tough and ultimately classic issues of human trafficking and racism through the eyes of an infectiously loud and boisterous homage to the glitz and glamour dominating the entertainment of the era. The clandestine gem within the humble confines rests downstairs, on a stage that provides little assurance, the decorations for which, while beautiful, are composed almost entirely of standing, painted silhouettes, with a ledge for the house band and another for several numbers. David Rossetti is incredibly effective as the reluctantly romantic male lead, Jimmy Smith. He consistently oozes vibrant, alluring energy, which ultimately does become romantic in nature. This is most apparent during “I Turned the Corner/Falling in Love,” a pivotal number for the story. This remarkable chemistry between the two leads lends to the genuine believability of Millie and Jimmy’s adventure into love, stumbling along their initial, respective penchants for womanizing and gold-digging, with enough charm to render a bull shark docile. But the most charismatic element of the musical came in the form of Roy Flores, who played the love-stricken unwilling kidnapper, Ching Ho. Although the role is not essentially the most crucial, his own unforeseen affection toward the elegant Miss Dorothy Brown (Amy Grass) is reflective of the overwhelming power of love within the world of “Thoroughly Modern Millie” and he carries this penchant with amicable grace. Ultimately, the fun-loving gloss and slapstick evoking the work of its chosen era looked effortless and delightfully free on stage, though the amount of hours dedicated to the heavily rehearsed, synchronized numbers was obvious. 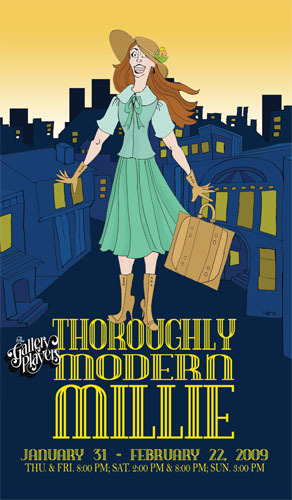 “Thoroughly Modern Millie” is a fun, quixotic fairy tale, down to the poisoned apple from a wicked, jealous, social witch, seamlessly glossing over themes reflective of the more appalling norms of the 1920s with an intentional glitter and sass, to the vivacious rhythms of the then-risqué jazz. The producer this show, Brian Michael Flanagan, and the Gallery Players are proud to continue their tradition of “Broadway in Brooklyn,” which focuses on the revivals of shows of Broadway past. According to director Neil J. Freeman, adapting these musicals to a smaller stage allows the Gallery Players to truly get to the heart of the production, since it can easily get lost in a larger spectacle. And in this case, although the visible closeness between the Gallery Players would have allowed them to settle for green glass, the actual production of “Thoroughly Modern Millie,” in reality, is a secret emerald.